A recent health scare relates to everyday technology—mobile phones’ potential to cause damage by radiation. Studies on the issue continue to contradict one another. The issue being debated in the scientific and political arenas is just how much radiation is unsafe, and if there are any potential long-term effects of cell-phone radiation exposure. http://www.safespaceprotection.com is an online compendium of news and research on electromagnetic fields. 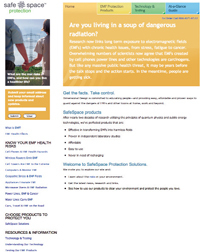 While radiations from mobile phone and cell phone towers are the site’s primary focus, it also has useful links describing research on radiation from objects of everyday use such as computers and microwave ovens. It is accepted knowledge that radiation and vibration from mobile phone handsets and mobile phone towers is not a tonic to animal body and birds but a hazardous modern necessity for the time being. It is inconceivable that radiations from Mobile Phone Towers do not affect human health and well-being. Even if we are sitting inside a rocky cave surrounded on all sides by dense foliage and vegetation or are lying hidden inside a rocky pit in the deep and unfathomable bowels of the Earth, our mobile phones still have range and we can still send messages and receive messages, which means the atmosphere around us and our surroundings air are saturated with radiations and unperceivable vibrations. It is known all over the world, even to tiny school children, that our little mobile phone handsets are much harmful to human body than the large television sets. Who will deny that saturated presence of unnatural radiations is harmful to human body? At times, authorities including the union minister for communication will issue press releases, assuring that every step is taken to prevent excessive radiation from mobile phone towers. But what steps are they taking or can they take, apart from dismantling towers and resorting to other costlier communication technologies? At times they will say that some kind of directives has been issued to limit radiation to harmless levels. What harmless levels, undefined and ambiguous? Are these directives being kept and observed by the tele-communication department? And the sound pollution caused by these omnipresent mobile phone towers! Almost all of them have diesel generators attached to them to substitute electrical power when electricity fails, which almost always does. Never seen or heard about a costly noise-proof generator attached to a mobile phone tower in India. Noise-proof generators are must for all mobile phone towers, but except just a few here and there, almost all of those towers use diesel generators. No lawyer has ever approached a court nor has a judicial court ever issued an order prohibiting the use of diesel generators. So now, all over India, we have freely-functioning mobile phone towers, transmitting as much communication and radiation as they can, and affecting the health and life our children, pregnant women, ailing old men, avian beings and livestock. Occasionally, a few research organizations, funded by government which in its turn is funded by BSNL, Airtel, Tata and Reliance, would conduct some divertive studies and declare that they have found beyond doubt that mobile phone towers causing hazardous radiation is a baseless allegation. Assam Agricultural University finding house sparrows survive more than tree sparrows in Guwahati does not prove house sparrows are not affected adversely by cell phone tower radiation. It only proves that house sparrows living in protected environment are less affected and tree sparrows living in the open are being eliminated en mass and becoming extinct.